These brownies are amazing. These are great for tailgating or even Thanksgiving dessert. How can you go wrong with pecan pie layered on top of gooey chocolate brownies? All this picture is missing is a big ol' scoop of vanilla ice cream! This recipe uses a box of brownie mix for the base. I used Ghirardelli Double Chocolate Brownie Mix, and it worked great. These were a big hit at the tailgate. Shh, don't tell anyone, but I stashed a few brownies at home so we would have a few to snack on after the football game. It's one of the perks of being the baker! Preheat oven to 350ºF. Lightly grease a 9x9-inch pan. Mix together brownies according to package directions. Spread in 9x9-inch pan. Whisk together melted butter, brown sugar, flour, corn syrup, vanilla and eggs. Stir in chopped pecans. Carefully spoon pecan pie mixture over uncooked brownies. Bake 30-35 minutes. Cool and cut into 12 or 16 squares. I'm not a dessert fan, but love brownies. This sounds incredible and a "must try". Oh yeah, nothing wrong with these. I made Bakerella's version a while back which puts all that in a pie shell. AMAZING STUFF! I used a Mocha Brownie mix that brought it up a notch! This sounds wonderful too! 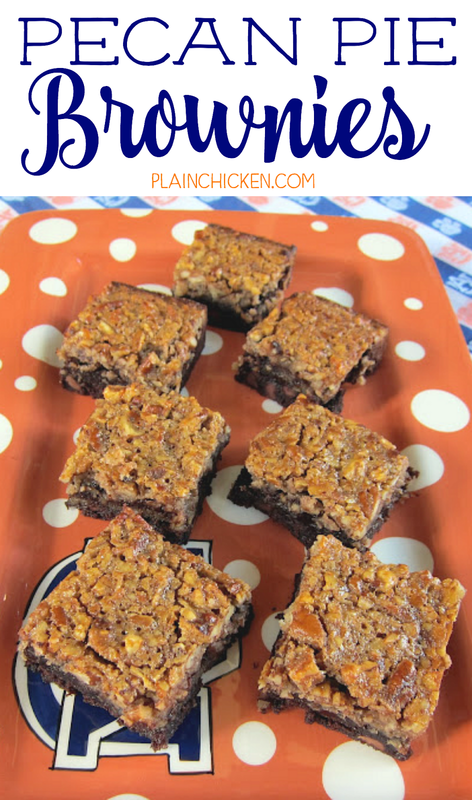 Never thought of pairing pecan pie with brownies - great idea!! I just finished making this. I couldn't find the Ghirardelli mix so I used Betty Crocker. Unfortunately after 35 minutes the top was overcooked and the brownie mix was undercooked. I'm not sure what I did wrong but I think it will still taste could over ice cream as a fudge/brownie/pecan topping. These are a 'must make' for my husband, he LOVES pecan pie and brownies AND ice cream. Made these tonight for my football night with friends, everyone loved them. One person wanted to know about your blog. Somehow I made these today without ever noticing the team logo on your plate; ironically we were watching the same game. These are cooling in my kitchen right now. I hope they make it until Thursday! If your top is getting too done, maybe try putting aluminum foil over it - we do that for pecan pies. I don't even like sweets but I just printed this out to make. Like, today. 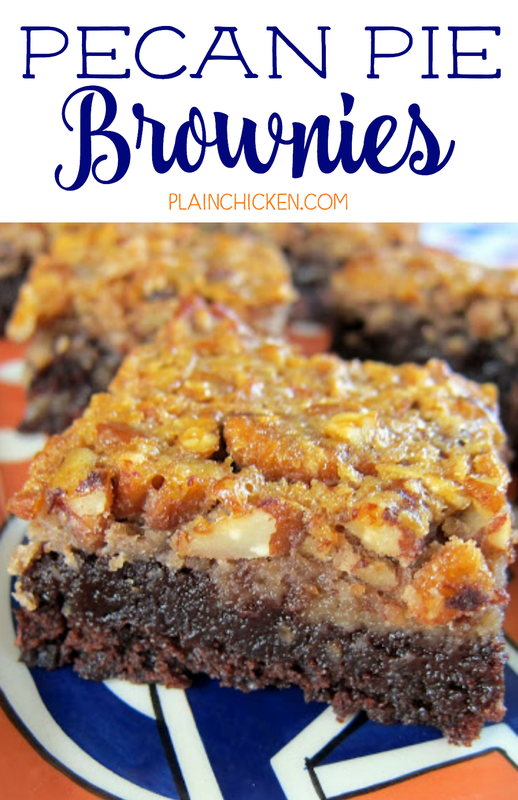 I love brownies and pecan pie so can’t wait to make these! I’m from Australia and we don’t get corn syrup here. I think our equivalent is golden syrup - thick, viscous and honey coloured. Is this the same thing? That sounds like the same thing. Maybe Google can give you some ideas on substitutes.But unfortunately, without further recipe testing, I cannot answer with certainty. As always, please use your best judgment regarding substitutions and modifications.